Vacation read #2 was How To Walk Away by Katherine Center. I’ve read some of Center’s earlier books and they are dependably readable and compelling, if a bit on the lighter side. 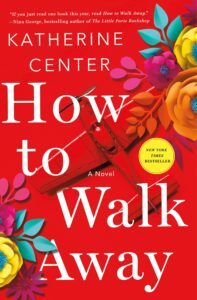 When How To Walk Away opens, Margaret, a woman in her late twenties, is reluctantly boarding a private plane with her boyfriend, who has just learned to fly. While up in the air, they get engaged, and Margaret sees her perfect future ahead of her: dream job, dream guy, dream marriage. Then they hit an unexpected storm and he crash lands the plane, leaving Margaret paralyzed from the knees down and with third degree burns on her face and body. When she wakes up in the hospital after several surgeries, her life is completely different. As I mentioned, Center’s books are generally light reading, and even though How To Walk Away deals with a serious topic, it was no exception. Margaret’s fiance turns out to be a selfish, terrible person, and he abandons her soon after the accident. She then faces a long recovery ahead, which she must go through without her partner at her side. But she soon develops a crush on her physical therapist, and it’s probably no surprise that they end up getting involved, despite facing several hurdles. I thought that Center’s depiction of Margaret’s spinal injury and recovery was pretty realistic – she clearly did her research – and to me that was the most compelling part of the book. I liked that Margaret wasn’t perfect and that she dealt with her injury in a pretty relatable way. Some subplots involving Margaret’s family were simplistic and a bit outlandish, but overall this was a satisfying vacation read. If you’re looking for a good beach book, give How To Walk Away a try. Everyone Is Beautiful, by Katherine Center, is an enjoyable, light book about Lanie, a thirtysomething mother of three who moves with her husband from Houston to Cambridge, MA for him to attend graduate school. As the book opens, she has just arrived in Massachusetts, and meets another mom on the playground who asks her when she is due. Problem is, she’s not pregnant. This question sets into motion a series of self-improvement steps Lanie takes to try to reclaim her pre-kid life, and Everyone is Beautiful is about the repurcussions of those actions. Everyone Is Beautifulis a compelling portrait of modern day parenthood and marriage, at least from the mom’s perspective. It’s funny and briskly paced and easy to read. I found it a bit simplistic at times – I don’t think relationships are as clear cut or tidy as some of those portrayed in the book – but I still enjoyed reading it. I could definitely relate to many of Lanie’s frustrations and observations about parenthood. It had not occurred to me to mourn losing those things until now. I had done each of those things, somewhere along the way, for a last time – without realizing it was the last time. And even after I knew that I was no longer a child, somehow I’d assumed those things could have come back to me. Or that I could have gone back to them. But watching the movies on this day, I became aware of infinite losses. Before I knew it, I had sunk to my knees. One little quibble with the writing – there is too much foreshadowing. I would have preferred to have the plot unfold naturally, without little clues throughout signalling what was to come. They were distracting and made me suspect that Center didn’t trust that her readers would stick around long enough to see what happened without being enticed by little spoilers. Her plot was more than compelling enough to keep her readers interested. Everyone is Beautiful is a fun read that ends on a very positive, affirming note. I’m glad I read it. Jenny Harris is nesting in her Houston home with her fiance, Dean, awaiting the birth of their child, to be followed by their wedding. But Dean grows more distant, especially after a coworker dies in a plane crash, and Jenny ends up becoming a single mother. Determined to take good care of her child, she tries to forget about Dean, relegating him to the past. Coping with a baby takes all Jenny's time, so when her perfect single neighbor takes an interest, Jenny is flattered but exhausted. Then, when she finally decides to take a chance and get to know him, Dean comes back into her life. In her stellar first novel, Center paints an accurate and humorous view of motherhood, from the physical changes to lack of sleep and exhaustion as well as the changes in friendships and feelings about men. Heather at Book Addiction says: "This novel was overall a very fast-paced, enjoyable, and heart-warming story that truthfully brought tears to my eyes. I really enjoyed it and I highly recommend the book." Trashionista also gave it a good review, calling it "highly recommended". Katherine Center has a new book out as well, called Everyone is Beautiful – the blog Does Mommy Love It? is giving away a copy of the new book, and reviews it, here. Now, can someone give me an extra hour every day so that I can get to some of these books?